This project began with a thought in the middle of the night. 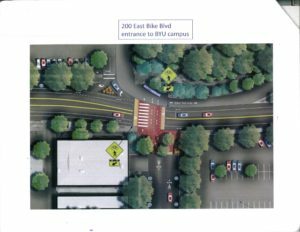 The thought occurred after the BYU Campus Bicycle Committee discussed creating a back-streets bike route from Wymount student housing to campus through the Tree Streets as a safe(r) alternative route to 900 E, a narrow, 35 MPH fast but often faster, and dangerous four lane road with minimal shoulder space. That got me thinking. What other student housing areas do not have safe way to campus? The area around 450 N just east of 900 E came to mind. 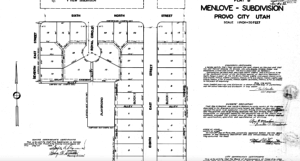 The area, which includes such mega-apartment complexes as King Henry, Belmont, and Centennial is one of the most densely populated areas in Provo. Shouldn’t bicycling and walking to campus, which is less than a mile away, be an viable option for students and others who live there? But just like, actually even much more than for students who live at Wymount, 900 E acts as a barrier to bicycling and walking to campus for students there. At least from Wymount, there is now a new multi-use trail on the west side of the street that students and others can use. Nothing like that exists on 900 E to the southeast. 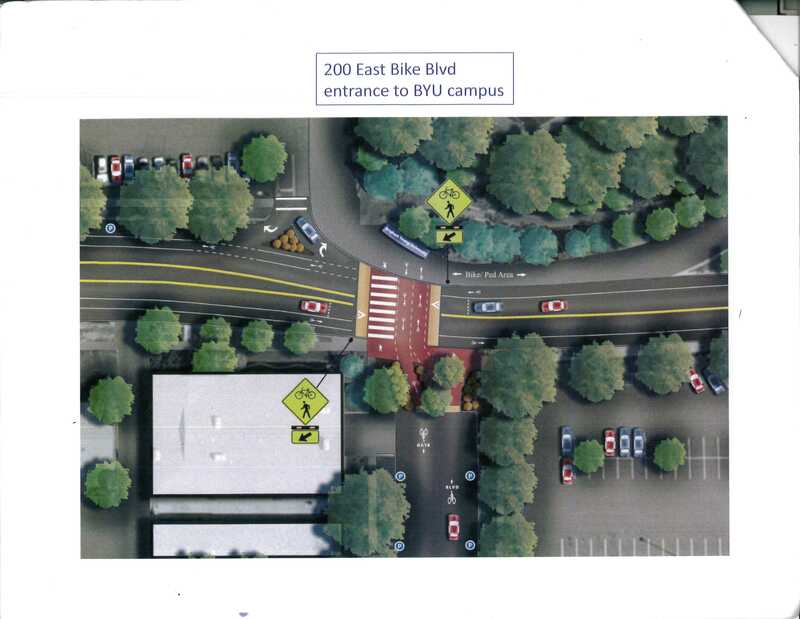 We knew from the Provo Bicycle Master Plan that 800 E, a quiet street that runs from Center Street up to 820 N and BYU, had been designated to become a Neighborhood Bikeway (like 200 E) as an alternative to 900 E as well as to narrow, busy 700 E. But how could we get students from that housing area over to 800 without subjecting them to treacherous 900 E? One night, I woke up and had an epiphany, though admittedly a naive one. Perhaps some property owners would allow us to build a path between their lots to bridge the gap between 900 and 800 E. I decided to jog over there on my morning run and check things out. What I discovered was a dream come true. A pathway already existed. It connected the southwest corner of the bioplasma donation center on 900 E to 800 E. (For those that remember Provo in the 70s, the plasma center was once the Star Palace.) Further research revealed that it was an official city alleyway and therefore public right-of-way. It was once a path that grade school students and others regularly used to get to the Joaquin Elementary School that once stood near 700 E. This path was the key to providing students living in that area with a safe route to campus by foot or bike and could act as an alternative to driving or taking the Ryde student shuttle. All students needed to do was cross 900 at the signalized intersection at 450 N and walk through the block to 800 E and they would be on a quiet street that led them up to campus. 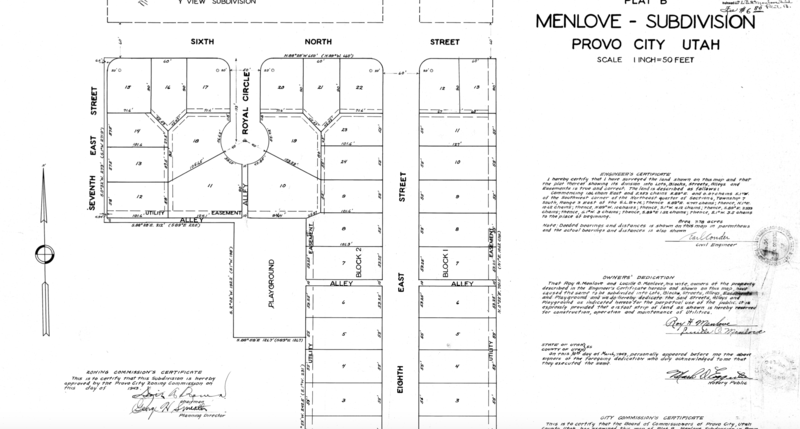 Here is a map of the alleyway that was part of the Menlove Plat B Subdivision in 1943. But this would not be a route unless we made it more appealing and safe and publicized its existence, so active transportation proponents took things into their own hands–literally. 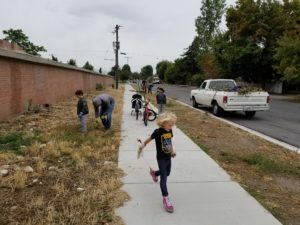 In late 2017, volunteers from bikeprovo worked with residents of the Joaquin Neighborhood (who all happened to be part of the bicycling community) to apply for a $5000 neighborhood grant from the city council and secured another $3000 from UTA to make a series of improvements, most of which have now been implemented. Thanks to Wayne Leavitt and others in the Joaquin Neighborhood for all their support. Here are the routes to campus we aimed to create. 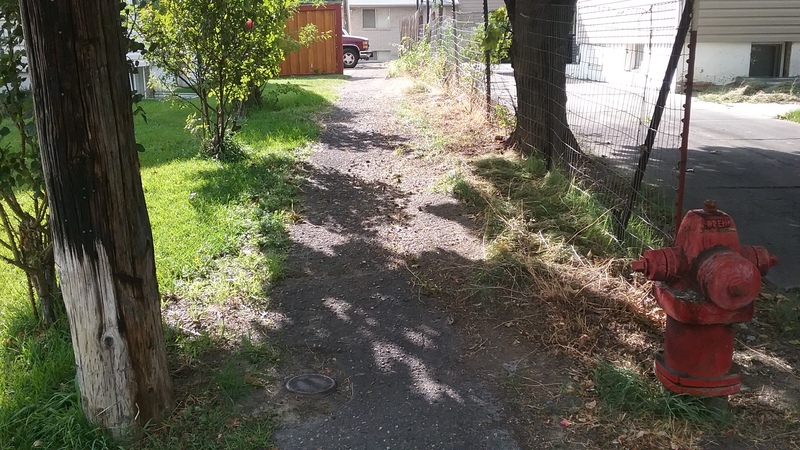 This fall, volunteers led by bicycling advocate extraordinaire Marlo Jensen and Colony resident and urban planning major Miles Miller cleared vegetation that had overgrown the pathway and another one that continued westward connecting 800 to the Colony and 700 E as well as 500 N. Here are before and after photos of the latter pathway (looking from opposite directions) between 800 and the Colony. 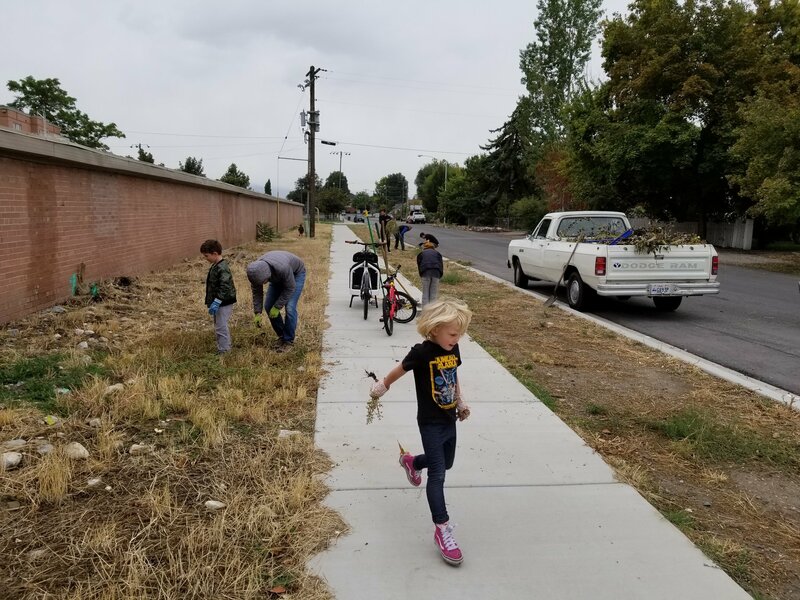 Also group of residents of the Maeser Neighborhood, through which the 800 E Neighborhood Bikeway will extend via 850 E, supported the project by organizing a goathead weed elimination clean-up along 850 E by the Vista Ridge Apartments on the first Saturday of October. Not only did the project rid the area of thousands of tire-puncturing thorns, it also generated hours to help match the grant received by their neighbors in Joaquin. And it was a lot of fun. The grant we received was used to pay for surveying work and excavation on the pathway between 900 and 800, which was narrow, asphalt, and in poor condition. 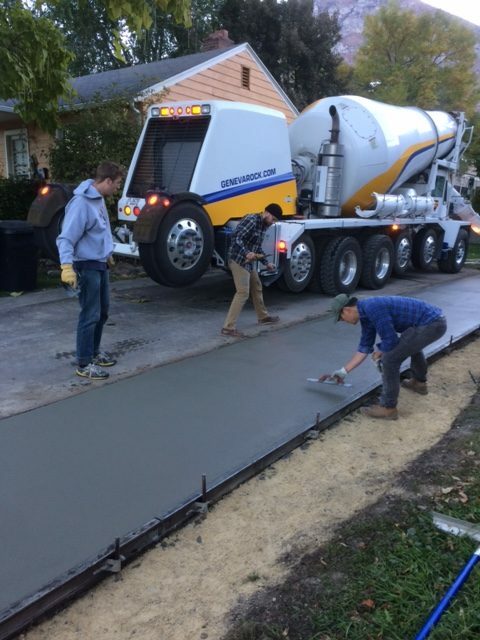 Then over two weekends in late October, dozens of volunteers from the bicycling community, the Joaquin and Rivergrove Neighborhoods, and BYU, with invaluable help from the Parks Department (in the form of lending us concrete forms and tools), poured and finished 15 yards of concrete to create a beautiful public pathway. Project organizers thank Western Paving for their donation worth $430 and especially Geneva Rock for its donation of 9 yards of concrete worth around $1350. We are particularly appreciate concrete wizards Terry Smith, Bob Coleman and Zac Whitmore, who directed our efforts. Meanwhile, the Public Works Department, drawing on the funds we received from UTA, painted bike markings on 800 E from Center Street to 700 N. Thanks to Jared Penrod of Public Works and the Streets Department for being great partners on this project. 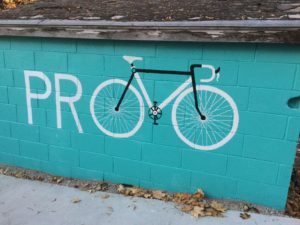 To further beautify the pathway, volunteers led by the Provo Bicycle Collective’s Kira Johnson, drawing on a $250 grant from the Mayor’s Office, painted a mural inspired by street artist Leuven’s iconic “Bike Provo” design on a shed next to the pathway. It looks awesome. The project is not yet quite complete. The city still needs to post “Neighborhood Bikeway” and “BIKES may take the lane” signs and add some more bike markers on the route, and do a curb cut on 820 N to ease bicycle access to the multi-use trail behind J-Dawgs that will take bicyclists and pedestrians up to the scramble intersection at 900 N and East Campus Drive (which is much safer than the 700 E/900 N/South Campus Drive intersection). Also, pedestrian access from 450 N to the intersection at 900 E is less than ideal. On the north side of the street along VASA Fitness, there is not a sidewalk and pedestrians must walk around parked cars. 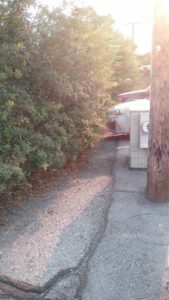 On the south side, there is not a sidewalk and usually space to walk along the parking lot but pedestrians have to deal with a trip hazards especially next to the Yoga studio (which was once a Mad Dog bike shop). It is sad that for decades such poor walking conditions have gone unaddressed, but we are hopeful that our efforts will lead to improvements being made there too. To bring attention to this route, in the coming months we will post signs along this route (as well as along 200 E, another new Neighborhood Bikeway). We are thankful to the Utah County Health Department for a grant to pay for the signs. We are confident that better bicycling and pedestrian infrastructure will keep residents (and in this case especially students) safe, encourage them to be more physically active, give them additional transportation options, and improve their quality of life. 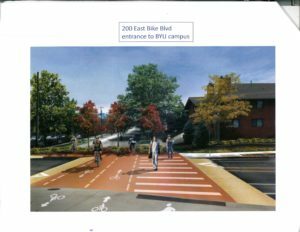 We are proud of this project, particularly the work of volunteers to construct a pathway for the public, but we urge the city to make improving walkability and bikeability a priority, particularly in areas around BYU, by allocating dedicated transportation funding to building sidewalks and bicycle infrastructure. 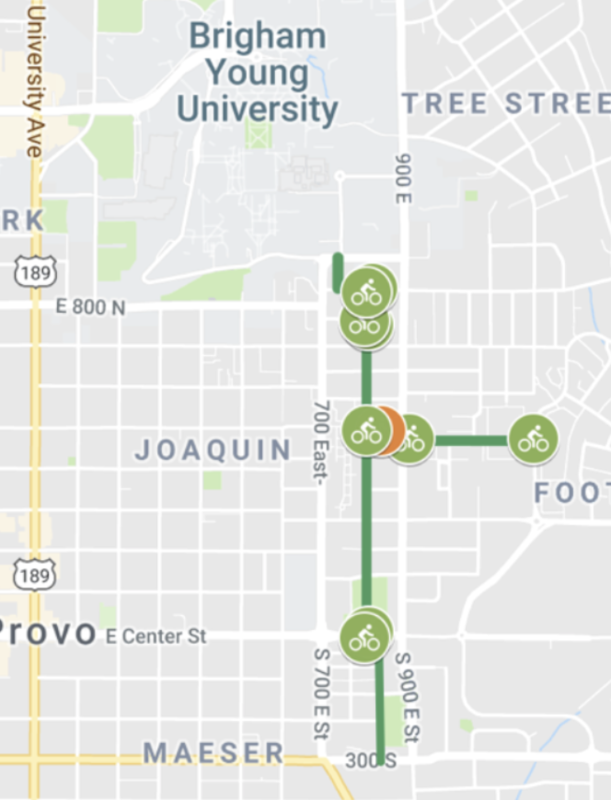 According to Census and Department of Transportation data, around 15% of Provo residents walk and bike to work and school, yet our city transportation budget and policies are almost entirely focused on encouraging and facilitating driving. Provo has achieved this 15% mode shares through circumstance (primarily by BYU requiring most of its single students to live within a 2 mile radius of campus) RATHER than city policies that fairly and wisely fund modes of transportation according to their actual current ratios and according to which ones are best for our quality of life and quality of air. We also urge the city and BYU to work collaboratively to reduce single-occupant auto commutes to campus and maximize those completed on transit, by bike, and on foot. Advocates of walking and bicycling are stepping up and acting. 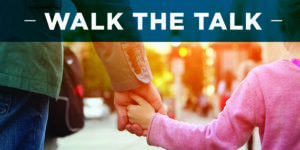 It is time for our elected leaders, city officials, and largest employers to do so as well. 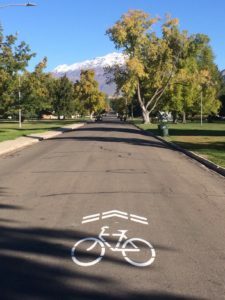 One of the greatest boosts to Provo’s quality of life in 2018 began to take shape on 200 E, between 800 N and 600 S in the Joaquin and Maeser neighborhoods, in the form of a project that prioritizes active transportation–bicycling and walking–through the transformation of this street into Provo’s first Neighborhood Bikeway. Sometimes called “bicycle boulevards,” “neighborhood greenways,” “neighborways,” “local-street bikeways,” “calm streets” or “quietways,” neighborhood bikeways “are streets with low motorized traffic volumes and speeds [moving no faster than 25 mph, with 20 mph preferred], designated and designed to give bicycle travel priority,” which makes them ideal for pedestrians too. They “use signs, pavement markings, and speed and volume management measures to discourage through trips by motor vehicles and create safe, convenient bicycle [and pedestrian] crossings of busy arterial streets.” Transforming 200 E into a neighborhood bikeway required redesigning it so that bicyclists of all ages and abilities feel comfortable sharing the travel lane with automobiles. 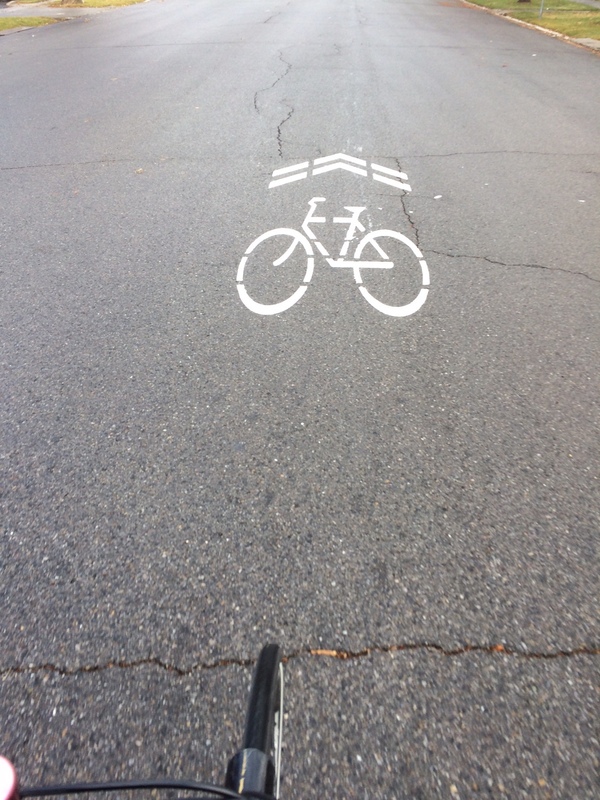 Here are some photos of neighborhood bikeways across the country. 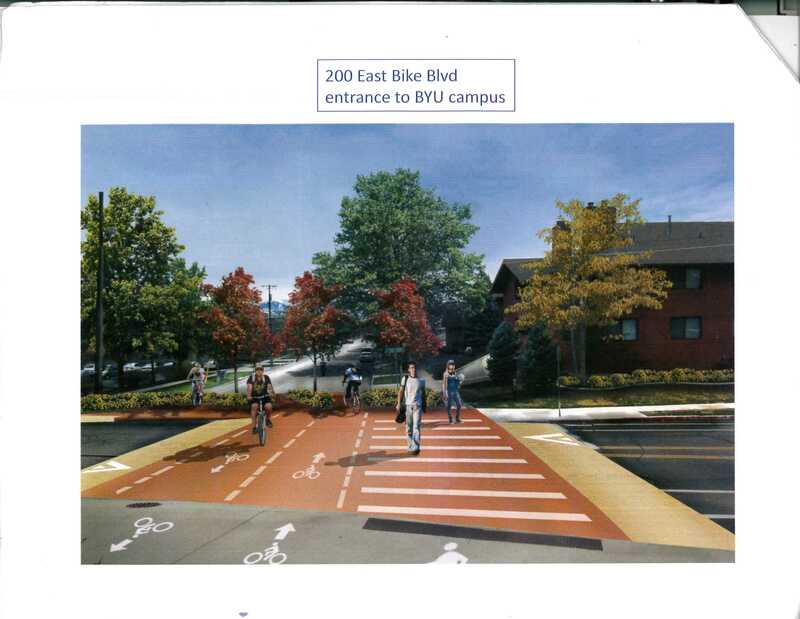 200 E is an ideal street for a neighborhood bikeway because it provides a 14-block connection from the Provo Frontrunner Station via 600 S to the downtown area and the ramp that leads up to the BYU campus at 800 N. (In the future, it will connect nicely to a route leading to the Canyon Road bikeway via 150 E.) 200 E can operate as a safe and pleasant route for residents of the Maeser and Joaquin neighborhoods on bike and foot to connect to 500 N and destinations such as the Library and the Rec Center. 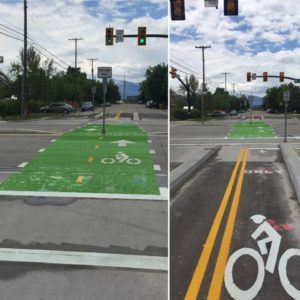 Transforming 200 E into a neighborhood bikeway has taken many years and been a collaborative effort between the city, neighborhood and bicycling advocates, UDOT, and UTA. 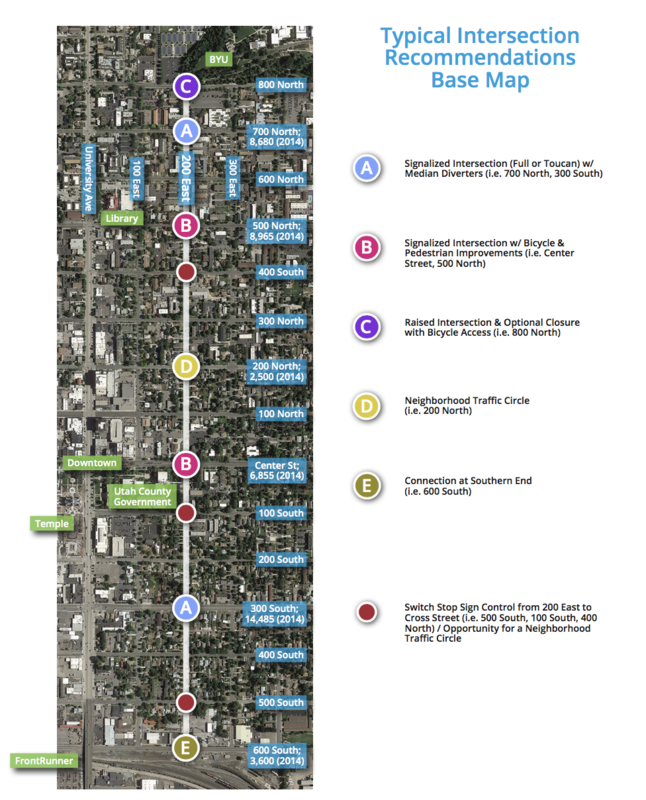 After the Provo Bicycle Master Plan (2013) called for 200 East to become a route for bicyclists, activists from the Joaquin and Maeser neighborhood and the wider bicycle community built support for the speedy implementation of this designation. First, under the cover of night (though with the city’s tacit approval–this is Provo, after all! ), they painted shared-lane markers on the street from Center Street to 800 N in May 2015. A few weeks later, they went further and in an act of (again sanctioned) tactical urbanism transformed three blocks–from 500 to 800 N–temporarily transformed that part of the street to make it safe(r) for bicyclists and pedestrians, and then hosted a community party to introduce the implemented concepts to the wider public. The process was aided by plan developed by Alta Planning + Design, part of which can be seen below. 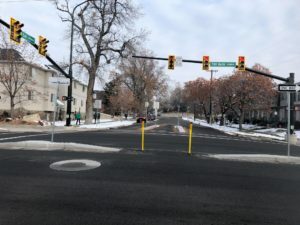 The first major improvement to 200 East was the construction of Provo’s first (and Utah’s second) bicycle-friendly signal at 300 South, to create a “convenient bicycle crossing of a busy arterial street,” as part of UDOT’s rebuild of State Street in 2016-17. Here is what the intersection looks like. Bicyclists cross the intersection in the middle and have their own signal. Pedestrian crossings were also improved at this intersection and elsewhere along 300 S as a result of this project, ending years of the Maeser Neighborhood being sliced into two parts by a fast road that was not safe to cross for seven blocks from University Avenue to 700 E.
This summer, as part of UTA’s construction of the UVX BRT line, Provo’s second (and Utah’s third) bicycle-friendly signal at 700 North was constructed bridging another busy arterial street. This is what the intersection looks like now. The signal has been operational since July, but as you can see it still needs paint on the road like on 300 S, as well as some tweaks to the signage and bollards. The UVX contractor will get to it soon. 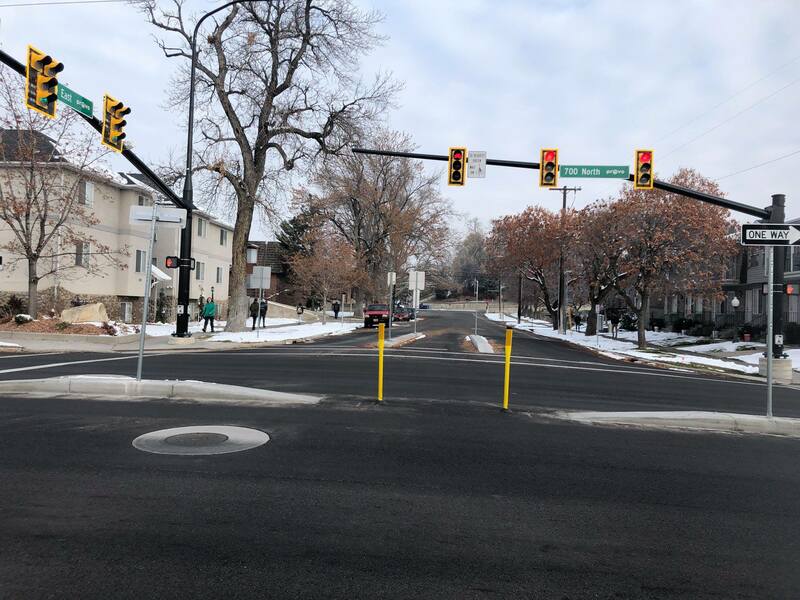 These two bicycle-friendly intersections also serve another important function: they eliminate all left-hand turns on and off of 200 E and all through automobile traffic at these two intersections, which helps to reduce the traffic volume on the street. 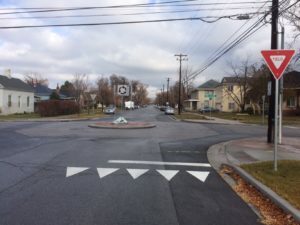 Also this summer, Public Works constructed curb-extensions at five intersections at 600, 500, 400, 300, and 200 N, which narrowed the width of 200 E at these corners and all the cross-streets except 500 N. In addition, the city built Provo’s first mini round-about at 200 N. Curb-extensions, which are also called “bulb-outs” and “curb-outs,” narrow the width of the street for pedestrians, and they and the mini round-about both help to reduce traffic speeds. In this photo of 200 N, you can see both the curb extensions and the mini round-about. 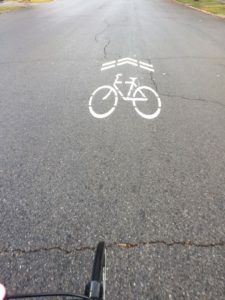 Finally, in recent weeks crews have posted signs telling bicyclists and drivers that “BIKES may use full lane” and painted in shared-lane markers on the street. More work needs to be done. Way-finding signage needs to be installed. More “BIKES may use the full lane” signs need to go up. The posted speed limit needs to be lowered to 20 MPH from 25 MPH, although these design changes are more important and already encouraging traffic calming and speeds appropriate for a residential street. 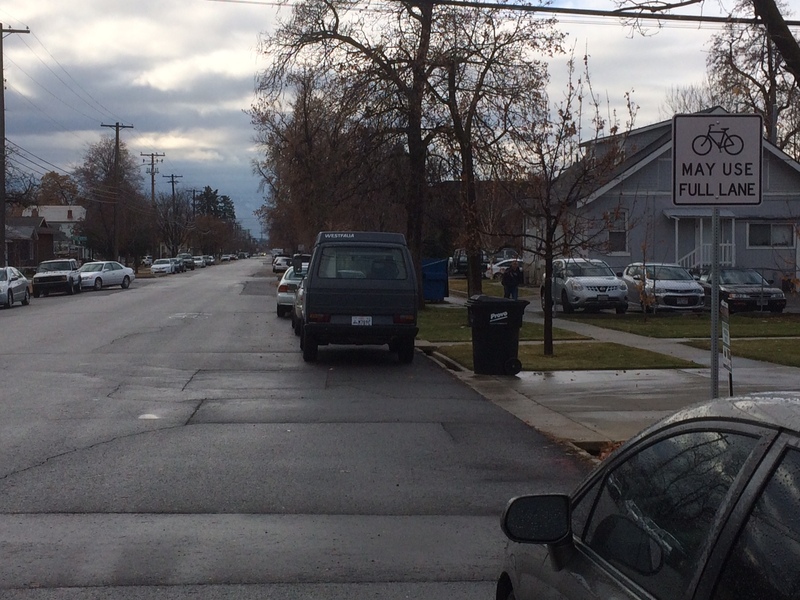 The bike lane on the east side of the street between 800 and 500 N needs to be removed and on-street parking restored because bicyclists may now use the full lane. The intersection at 800 N needs to be addressed. Here is how Alta imagined it might look like. Isn’t this design, which prioritizes pedestrians and bicyclists going north and south, and vehicles going east and west, a lot better than the mess it is now? 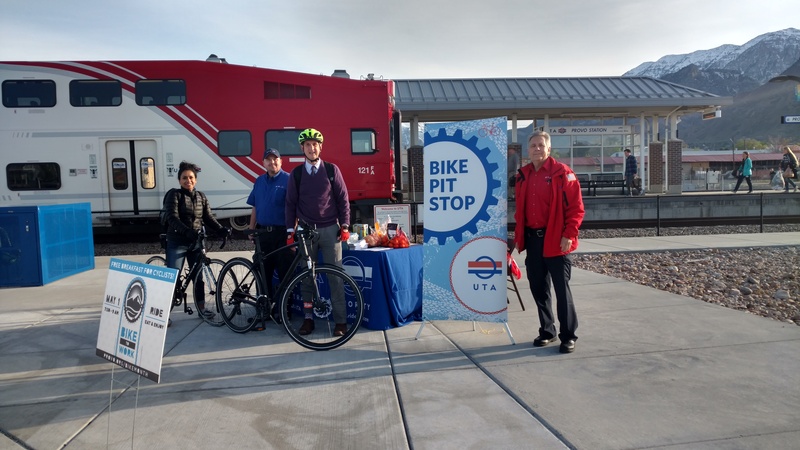 Thanks to collaboration between neighborhoods and the bicycling community and the city’s Public Works Department, UDOT, and UTA, people on bicycle and foot now have a safe(r), pleasant, and convenient way to move along this corridor from the Frontrunner Station, downtown, and BYU. 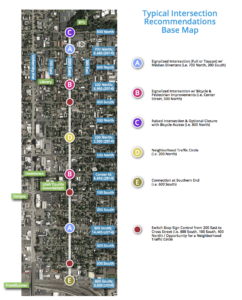 The route connects (or will connect) with other bikeways forming a network that provides people with more choices to move around Provo. In short, these improvements are about giving people transportation choices and improving the quality of life for everyone in our community. Want a Happy Ending if your Bike is Stolen? 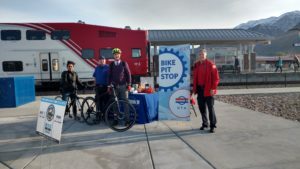 Here I am on Bike to Work Day, along with Lucy Ordaz, another bikeprovo board member, at UTA’s breakfast station. At work, we have a covered bike rack right outside the front door which made it easy to lock up and get in the building. On Sept 19, when I came out out the building to ride home, there was no bike, and the cut lock was laying on the ground. I called 911 and a patrol officer from SLC PD responded surprisingly quickly and took the report. Fortunately, the bike rack is covered by our security video system, so they were able to provide SLCPD with a close up of the person that stole it as well as video of the whole sequence of events. The woman who stole it had actually come into the building, talked with the security desk to ask about using the restroom, then left the building. A minute later she was seen coming back straight to the bike rack with some kind of tool that she used to cut the lock and calmly ride away. 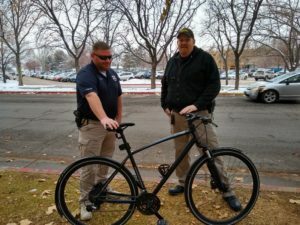 About 2 months after it was stolen, I got a call from the detective that the bike had been located at a pawn shop in South Salt Lake. They found it there during a routine check of serial numbers in the pawn database. The detective was very helpful in getting through the process to seize the bike and get it returned. It took about 3 weeks from the time they found it until I got it back. It is in suprisingly good shape – someone added a kcikstand and a water bottle holder – but it does need a tune-up now. 4. Don’t park in the same place every day. 5. Keep the bike inside a building if you can. At the Pedestrian Summit on November 29th, Provo was well-represented by attendees (at least five) and presenters. Chad Thomas, from Economic Development, and Mary Wade from the PTA board at Timpanogos Elementary, participating in a panel discussion that followed the keynote speech of Jon Larsen, Salt Lake City’s Transportation Director. Chad Thomas: It’s important to be willing to say no to developers until they agree to standards we have set to keep our cities attractive and walkable. Chad also stressed the importance of leaders truly walking the talk and moving toward active transportation and transit. Mary Wade: Nearly 100 families responded to the PTA’s survey to find out how they feel about walking or biking to Timpanogos, a walking-designated elementary school here in Provo. Regularly seeking out and responding to their voices is essential if we want to get our Safe Routes to School plans right for education, engineering, enforcement, encouragement, and evaluation. We can work toward healthier cultural norms as we positively frame our messaging for what’s possible in our neighborhoods. 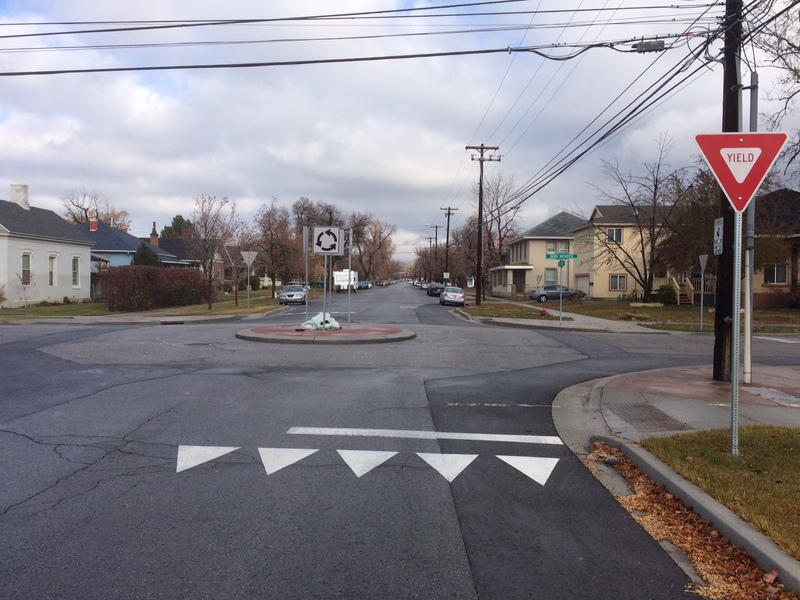 A giant doughnut could be the key to slowing down cars in front of the Orem Fitness Center. 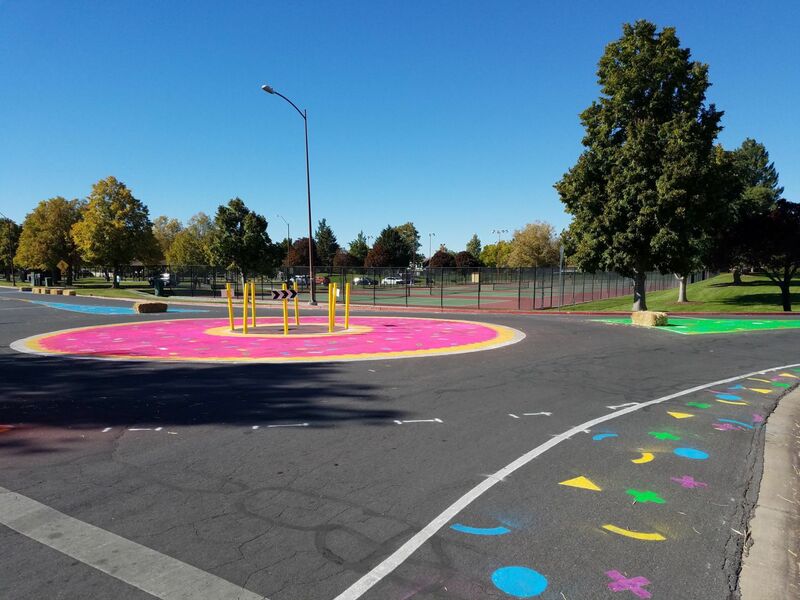 Painted by a group of volunteers who took to the roads by the Orem Fitness Center on Friday evening with paint and a vision to improve safety for pedestrians and cyclists, the temporary traffic calming fixtures like the pink doughnut could be used to make Orem roads safer. Join us for the Provo Bicycle Committee meeting this Thursday, November 8 at 5pm in the Provo City Community Development Conference Room for a presentation by @mayorkaufusi, project updates, and to get involved in advocacy opportunities. It’s time to put our money where our mouths are. 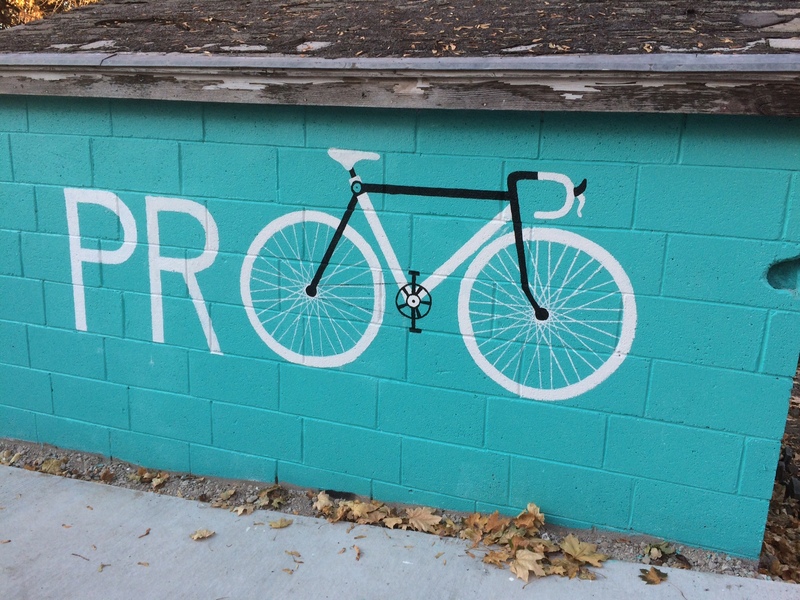 If you believe increased bike-ability will improve Provo, we need your help. We’re raising $500 to affiliate as a 501c3 nonprofit organization. This will allow us to more easily raise money to fund tactical urbanism projects and hire urbanist speakers to train city employees. We only need $75 more dollars. 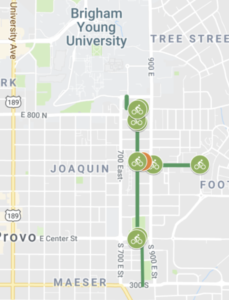 Will you give for a bike-friendly Provo? Donate today! Link in bio. Art installation: Tonight (Friday) starting at 7pm, 165 S 600 W, Orem. VOLUNTEERS NEEDED. See it in action: Tomorrow (Saturday) between 10am and 2pm, 165 S 600 W, Orem. Bring your bike and meet at the Provo Central Station (300 W 600 S) for a tour of the city’s bike lanes and pathways. City officials will be there, so this is a good time to use your voice to encourage Provo to build more!